After completing my Poisson Dieppois replica to a reasonably acceptable standard in mid-2008, my wife and I drove it to our home in France from our (working) home in Germany. Over a few days we travelled and visited various places en route, including Le Mans, where the Poisson Dieppois story had first intrigued me. The car ran faultlessly, despite certain people insisting that such a long trip (well over 1300kms with our planned diversions) would result in the car arriving in France on the back of a recovery truck. It did not. We arrived at our house and stopped the traffic! Literally. Almost every vehicle using our little section of the D740 on that hot July afternoon acknowledged the car with “Mon Dieu!”, “Formidable!”, “C’est un voiture magnifique!” and other colourful affectations. We were home. You can read about our first Val De Vienne exploits on another page, but that Sunday at the end of August really brought home the car’s major inadequacy—the engine was desperately tired. Although PRV V6 engines are tough and long-lasting, bearings, piston rings etc all have a finite life and Groupie’s were close to the end. High running temperature on the circuit (the car had been fine driving down), lowering oil pressure and a need for maintenance all conspired to leave me with no choice. Rebuild or replace. I got to work pricing up a rebuild. The PRV V6 crankshaft is renowned for rarely needing a regrind, so bearings were costed, as were combinations of piston rings/pistons/piston & liners. 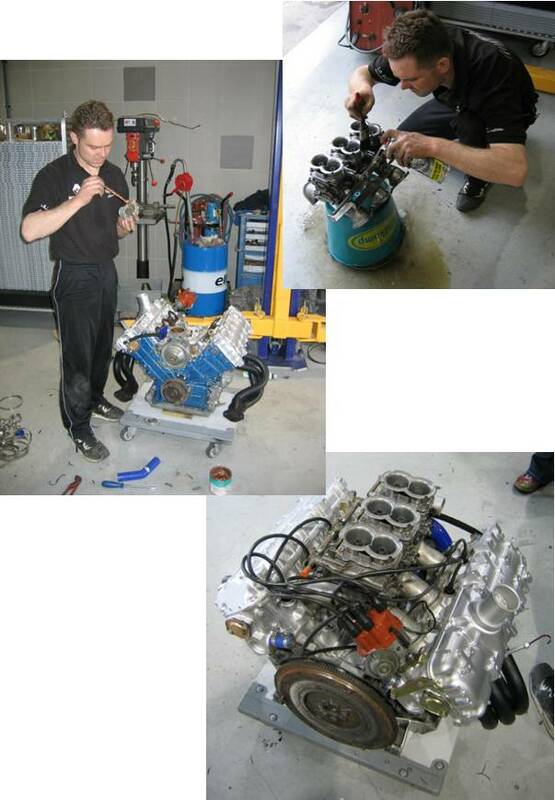 Then full gasket sets, new valves, valve guides and seats, exhaust manifolds…..and so the list grew ever longer. And expensive. I had heard about an ex-race engine that was sitting at the premises of Erwin van Dijk, Zoet Racing in Harderwijk, Netherlands. Sending an email I asked Erwin if the engine was for sale, and at what price. It wasn’t for sale, came the answer. So I started looking at other engines, but reckoned that my own was a better bet for rebuilding as I did at least know it was a runner. But again, the high cost of buying things like Weber 42 IDA’s, plus inlet and exhaust manifolds made the project too expensive. Now, I can’t remember the exact point at which Erwin had a change of mind, but when I asked him again, he agreed to sell me the engine! I think he was persuaded by his friend Michiel Haagsma. Life was so sweet at that time. Next I had to find the money. I have a very supportive bank, so the money was available. Easter 2009 was when we would collect the engine from Erwin and take it to France on our long drive in Kenny the Kangoo. I had made a small box for the engine to sit in and it fitted well. Ratchet straps were used through the cargo rings in the floor and the engine was solid in the car. The engine sat well in the back of the Kangoo and did not move at all, our journey to France was overall quite uneventful. The next part of the project was beginning. Click below for "The New Engine, Part 2". Click on the logo above and visit Erwin's company. A very friendly welcome awaits everyone. Erwin's parents even gave us a lovely lunch! Thanks, Ma & Pa Van Dijk.